If like me, you have a music library made up of different music formats, and you want to be able to sync them to your portable music player in one music format say mp3. 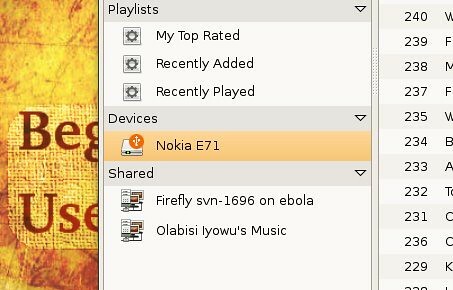 Example, my music collection is composed of different formats, .mp3, ogg, aac but I want to sync everyone of them as mp3 to my Nokia e71. This is where .is_audio_player comes in handy. Nope its not an application, nope its not a codec, its not a library either. Its just a file (yeah file) its a file you place in the root directory of the storage of your music device from where it does its magic. 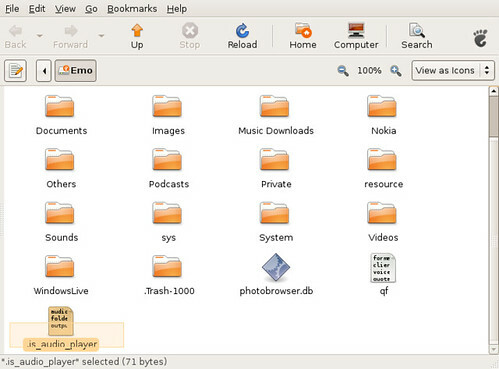 folder_depth = Here you indicate the folder depth of the music folder (remember that every storage device attached to your Linux computer is mounted on /media/ hence you will start counting from the device mount point. In my case it was. Below is the .is_audio_player file inside the memory card of my nokia. Once all is set, you can now plug your portable music player to your Linux computer and open Rhythmbox. Transferring from your music library in rhythmbox to your portable music device might be slow, especially if it has to encode them to another music format before the transfer. In the end I was able to encode all my ogg to mp3 files and sync them with my freedom hating E71 on the fly. I hope this helps someone out there. I don’t know if this method would work with ipods. Legends have it that Amarok supports .is_audio_player I can’t tell since I have not been able to get it to work in amarok 2.1. If you have been able to please let me know. The Original ogg file on my music computer library is unaltered.